A limited liability company is a very popular business form that combines some of the best features of a corporation and a partnership. Like a partnership, an LLC is taxed through its individual members. Like a corporation, it provides limited liability to its members. In most situations, the personal assets of LLC members cannot be reached for the debts or liabilities of the business. But, also similar to a corporation, there are certain scenarios where personal assets can be reached. Most LLCs have more than one member. In recent years, a variation called the single member LLC has become widely used. As the name suggests, these LLCs have only one member. While the structure and organizational requirements of single member LLCs are essentially the same as ordinary LLCs, there has been some uncertainty as to whether these businesses afford their members the same type of limited liability. Initially, not all states recognized single member LLCs. Now, all fifty states and Washington, D.C. recognize these business forms and have statutes governing them. 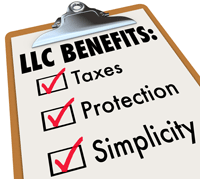 Generally, single member LLCs provide personal asset protection to their members for the liabilities of the business. But, they do not always provide the reverse protection that a corporation or ordinary LLC includes. In the case of an ordinary LLC, the personal creditors of the member cannot go after that member’s share without what is referred to as a “charging order”. A charging order is a legal device that allows the creditor to place a lien on the member’s LLC interest. The member’s interest is essentially any distributions made to them by the LLC. Therefore, creditors can collect the members interest but not outright and not without jumping through a number of hoops. In the case of a single member LLC, the charging order protection may not be provided. While some states like Wyoming have specific laws making the charging order protection applicable to these types of businesses, other states, like California and New York, have made no decisions distinguishing ordinary LLCs from single member LLCs. Therefore, in these states it is important to remember that legislation and judicial decisions have the potential to cause serious problems for business owners in the future. When wrestling with matters of business formation there are many factors that need to be considered and the advice of a seasoned business law attorney can help. Contact our office for a consultation today.